Discussion in 'iPhone and iPad Games' started by FlagellumDei, Nov 5, 2015. Do you love money? Want to be rich and become a business superstar? Sure you do! Play now as an entrepreneur, use strategy and manage your business in the most creative way possible to grow your corporate empire. Get rich from zero to hero! 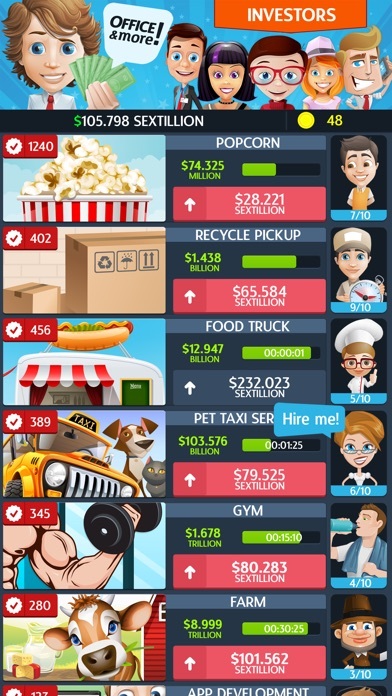 Business Superstar is a business simulation game all about money, prestige and glory. 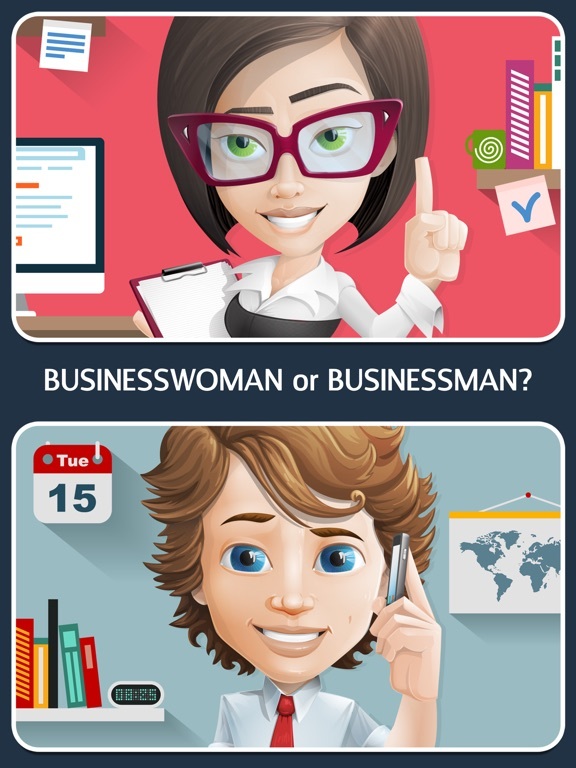 * * * * * * * * * * * * * * * * * * * * * * * * REVIEWS: "Business Superstar, an absolutely amazing business simulation game/endless clicker for the iPhone and iPad" - Touch Tap Play "This is the most exciting business simulation that you are able to play for free" - CheatersCircle * * * * * * * * * * * * * * * * * * * * * * * * GAME FEATURES: *** BUSINESSMAN or BUSINESSWOMAN? *** Play as a young college-educated BUSINESSMAN, filled with life, energy and ambition. Run and manage your own gym, app development, casino, insurance company, space tourism etc. Play as a smart, elegant and attractive BUSINESSWOMAN, and launch your own fashion brand, run beauty shop, dance studio, jewelry store, hotel superstar etc. 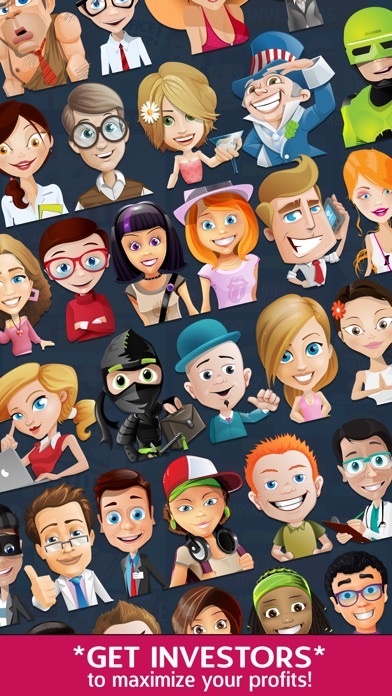 *** HIRE 210 PEOPLE TO WORK FOR YOU *** Your business is slow and sticky? No problem! Hire 130 assistants to help you to grow your business faster, and work with 73 investors to send your profits sky high. 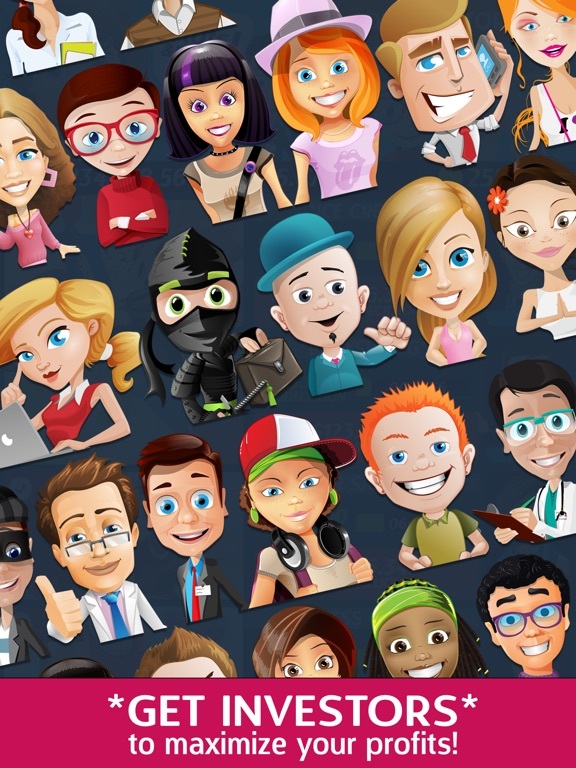 *** REACH THE BUSINESS ELITE SUPERCLASS *** Making lots of money is fun, but what about reaching the business elite superclass? It’s easy! 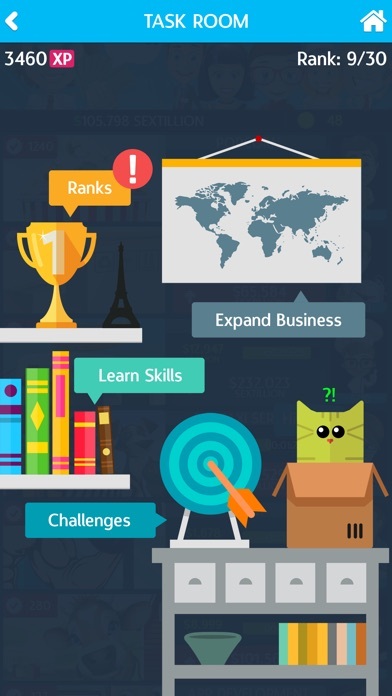 Learn 40 business skills, complete 210 challenges, and expand your business on all continents. Earn experience points, boost your self-confidence and reach the highest prestige rank! 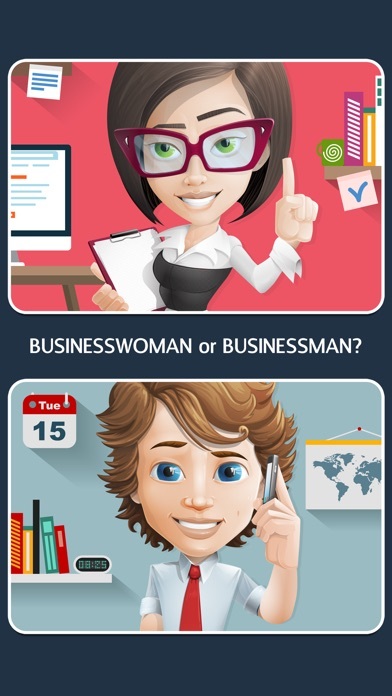 Become a business superstar! *** DEAL WITH BUSINESS CRISIS AND HANDICAPS *** Manage strikes and protests, corruption, burglary, accounting irregularities, watch out for inspection and competition, and survive even a Wall Street crash! *** BUILD YOUR REPUTATION *** Invest in your business reputation to boost your profits and reduce business upgrade prices. Get social media followers, trade show visitors, boost your website rank and advertise in media. *** STOCK MARKETS *** Enter the stock market to trade with stocks and earn extra money. Get stockholders (your facebook friends) to get bonus profit when you sell your stocks. Also, you can invest in your friends' stocks too for extra money and dividends! Dividends are a great way to earn automatic income as long as you have stocks! 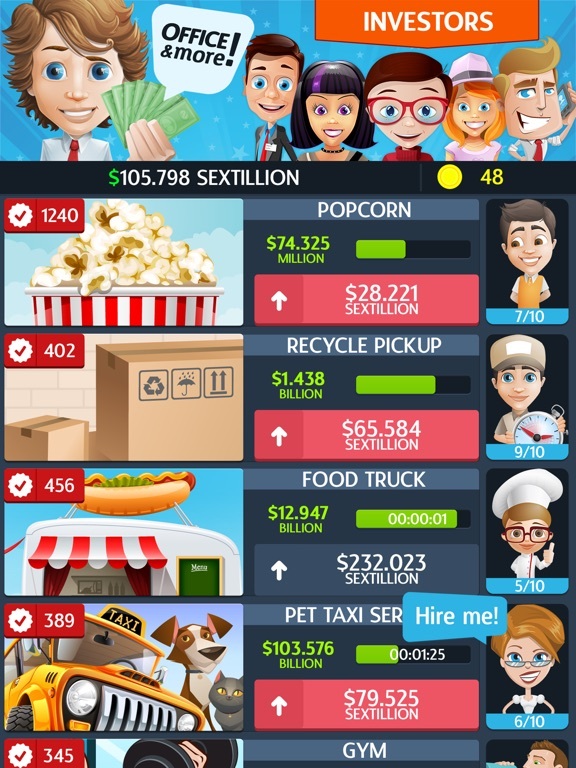 *** EASY TO PLAY FOR THE WHOLE FAMILY *** No complicated stuff, manage everything whit a single tap, even your dog will know how to play it :-) *** NO HONEY, NO MONEY *** Don’t forget to visit the kitchen to feed your avatar to keep high productivity, so go to office often and manage your tasks wisely. 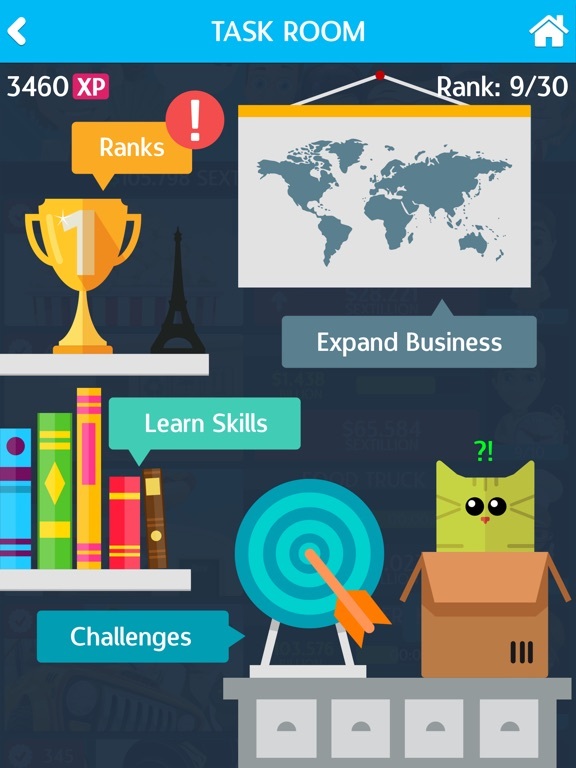 Or just play with the silly office cat to kill time and earn some kitty rewards. 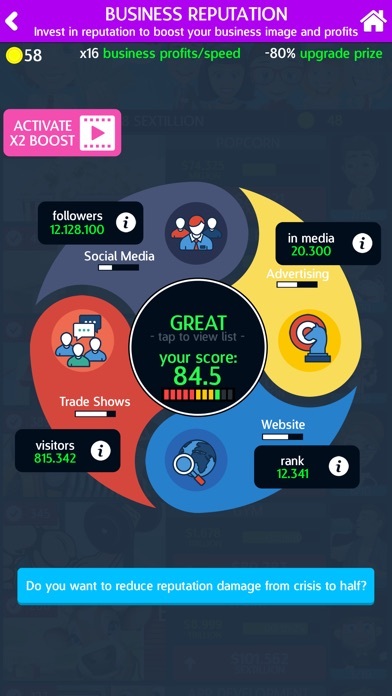 *** WARNING *** Business Superstar is a highly addictive game from the very start, once you start playing you just can’t put it down… Enjoy! I'm going to download this again. All these updates ! I'll leave a review later after I get home. Giving this another shot. Originally downloaded when it first came out . Now there have been several updates and the dev is clearly working hard. A new update is out now! Version 1.6.1, which brings gratis gold and spins for gold packs. The game is now available on Google Play too!